The biggest tragedy in Malcolm Lowry’s life (in his own opinion) was when the lakeside shack he lived in burned down. Not only did he lose his home and many of his possessions, but he also lost several years’ work – the almost complete manuscript (and almost all associated notes) of a novel entitled In Ballast to the White Sea. Lowry was devastated by the loss, and this sadness appears in several of his (thinly veiled) autobiographical novels. He never attempted to rewrite In Ballast to the White Sea, but instead went on to produce the highly regarded Under the Volcano. Then, of course, he drank himself to death. In Ballast to the White Sea was presumed lost for a long time, but it later became apparent that Jan Gabriel, Lowry’s first wife, had a copy. It was an early draft, given by Lowry to Gabriel’s mother about six years before the improved manuscript was destroyed. Gabriel retyped the whole thing in the early nineties, and this document has been picked apart, edited and annotated in great detail by several North American academics. In Ballast to the White Sea (A Scholarly Edition) contains as much of the novel as is available, but all of it based on a source text over half a decade less complete than the novel at one point was. The Lowry text takes up about 250 pages, there are then extensive annotations (almost 200 pages), as well as a detailed introduction, textual notes, a huge bibliography and a little appendix containing some related notes from other collections of Lowry’s papers. The novel itself is mixed. It is clearly an early draft – there are inconsistencies in punctuation, there is some incredibly wooden dialogue, there is repetition of metaphors and plot that seems to be present by mistake rather than design. The plot moves slowly, too, with a weak central section (rich, granted, in literary references) that prolongs the real narrative for no clear reason. The plot, reduced, is thus: a student at a good University has a boozy night with his brother, who tells him that he plans to kill himself. Sigbjørn laughs off his brother’s comment and verbally encourages him, doubting the sincerity. His brother does kill himself (whoops) while, elsewhere, Sigbjørn’s father’s shipping company has a series of terrible accidents (lots of death) that may or may not have been engineered for the insurance. Also, Sigbjørn has written a novel but then discovered an already-published book almost exactly the same. He signs up for an entry level job on a freight ship, he sees one of his father’s ships burning, his ship changes its destination and he arrives in Norway, home of the writer who pre-wrote his book. He finds him and they become friends. At this point the manuscript fractures and the reader is presented only with notes and suggestions and possibilities for the ending. Possibly Sigbjørn finds a lover and becomes happy, he decides never to write again and becomes happy, he decides to stay in a beautiful Northern country and becomes happy. 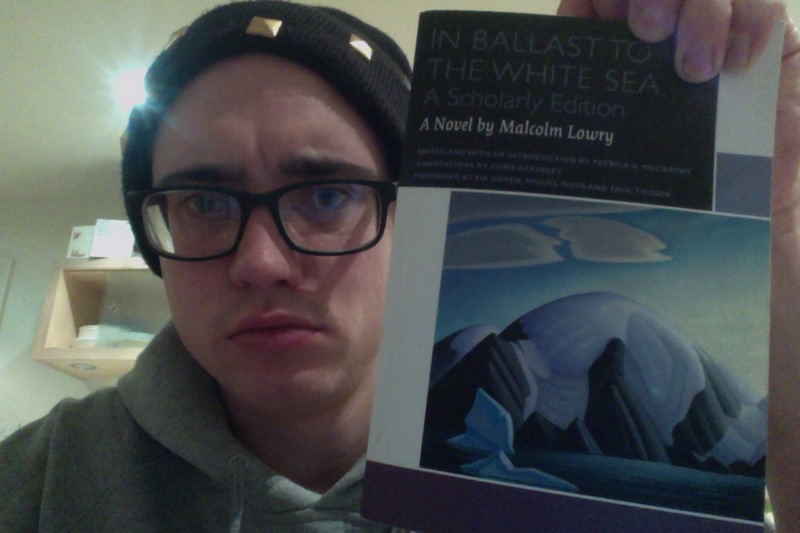 Either way, the ending is optimistic, in complete contradiction to everything else I’ve ever read by Lowry. Perhaps because he was still young when he wrote this, or perhaps his pre-Mexico drinking hadn’t yet drowned all sense of Hope and Optimism. His marriage hadn’t yet fallen apart, he hadn’t yet become used to literary rejection, he hadn’t yet written the masterpiece he (rightly) felt himself destined to produce. He was hopeful, which was a little unnerving. When the writing within In Ballast was good, it was gorgeous. There are many pages that are sublime and evocative, that trace landscapes of the industrial north of England or glacial Norway, or describe interiors of pubs, bars and boats. There are two over-long chapters that consist entirely of debate – and these are both weak. They may be clever in terms of how well-read they show Lowry was, but they don’t advance ideas or plot enough to be justified. I find it hard to believe that a refined version of the novel would have included them, but here they are. The editors have not tried to improve the text, they have instead tried to reproduce, from Jan Gabriel’s manuscript, a text resembling Lowry’s draft as closely as possible. The annotations are informative, though do sometimes go into excessive detail (for example, describing every hole of a golf course visited in the text). Generally, though I found the notes interesting far more than I found them boring, and I’m glad I read them. In Ballast to the White Sea is not a finished novel, though. It is not a book for the casual reader, it is only for the geeky Lowry obsessive like myself. I enjoyed seeing a different stage of the man’s development as a writer, but this lacked the polish and, crucially, the power of his later, tragic, works.